Bodhgaya, Bihar, India – The sky was cold and foggy this morning as His Holiness the Dalai Lama drove the short distance from the Tibetan Temple to the Kalachakra Maidan, but the sun came out shortly afterwards. An estimated 30,000 people, including 10,000 monks and nuns awaited His Holiness. He greeted people as he walked to the stage from where he saluted the crowd to the front, left and right. He was soon seated on the throne. Students from the Central Institute of Higher Tibetan Studies, Sarnath, young men and women, lay-people and monastics, recited the Mangala Sutta in Pali. They were followed by a group from the Tibetan Institute for Performing Arts who sang the verse of refuge and the salutation from Nagarjuna’s ‘Fundamental Wisdom of the Middle Way’ to a musical accompaniment. Finally, a group of Taiwanese chanted the ‘Heart Sutra’ in Chinese. They were among 3300 foreigners from 70 different countries attending this teaching. To meet their needs His Holiness’s words are being simultaneously translated and broadcast locally over FM bands into English, Chinese, Hindi, Russian, Mongolian, Vietnamese, Korean, Japanese, French, Spanish, Romanian and the Amdo and Tawo Tibetan dialects. “The last teaching was mostly for an Indian audience and was publicly translated into Hindi,” His Holiness explained by way of introduction. “This time there are many Mongolians among the faithful monastics and lay-people who’ve come to hear the teaching of the Buddha. What’s important to start with is to have a perfect motivation. On the part of the Lama that means not teaching out of any expectation of wealth or fame. Turning the Dharma into a business is very negative. When I learned about Tulku Tsullo’s three commitments—not to eat non-vegetarian food, not to ride animals and not to take any payment for teaching—I was very impressed. And may we train in the bodhisattva path. “This tells us that the Chinese are traditionally Buddhist. The wisdom celebrated here isn’t just any knowledge, but the wisdom realizing selflessness. After the ravages of the cultural revolution the Buddhist population in China is growing again. “In Mongolia too there have been three phases of Buddhism. At the beginning it travelled up the Silk Road and through Mongolia. Then there was the era when Mongolians had relations with the Sakyas and finally the Third Dalai Lama engaged with them. In return they gave him the name Dalai Bakshi. Buddhism mostly spread into Mongolia from Tibet. When I first went there in 1979 there were old monks who couldn’t actually speak to me, but were able to communicate through written Tibetan. They were permitted to practise inside the Ganden Thekchenling Monastery but not outside it. 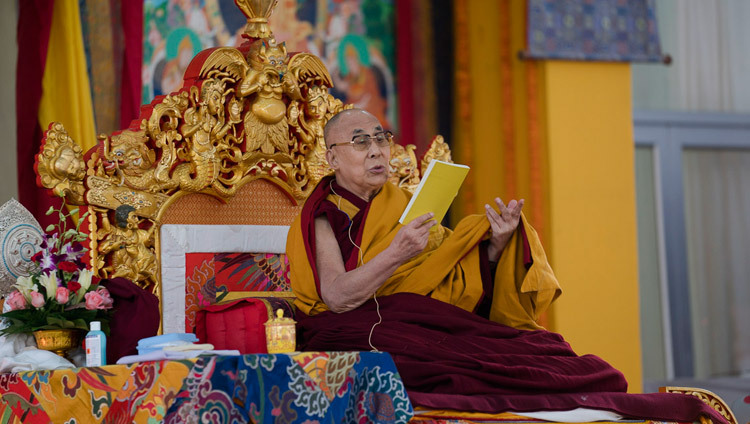 His Holiness explained that he was going to teach the ‘Commentary on the Awakening Mind’ and that the introductory verse derives from the Guhyasamaja Tantra. He mentioned that he had received Nagarjuna’s six texts on reasoning from Serkhong Tsenshab Rinpoche and his ‘Fundamental Wisdom of the Middle Way’ from Khunu Lama Rinpoche, who was able to compare the Sanskrit and Tibetan editions. He also vouchsafed that he received the ‘Hymn to the Absolute Reality’ from former Ganden Throne-holder, Rizong Rinpoche in the place where he observed his three year retreat. His Holiness noted that he would, in addition, teach the ‘Thirty-seven Practices of Bodhisattvas’ by Ngulchu Thogme Sangpo, someone celebrated in his life as a bodhisattva. A book containing the ‘Commentary on the Awakening Mind’ and the ‘Thirty-seven Practices of Bodhisattvas’ in Tibetan, Hindi, Chinese, English and Spanish had been prepared for free distribution by the Organizing Committee of the Mongolian Sungchoe Organization. The Tibetan section included His Holiness’s own composition, ‘Praise to the 17 Masters of Nalanda’, and he elected to read that first. He read the verses in praise of Nagarjuna, Aryadeva, Buddhapalita, Bhavaviveka, Chandrakirti, Shantideva, Shantarakshita and Kamalashila. He noted that Shantideva composed the ‘Compendium of Trainings’ and ‘Guide to the Bodhisattva’s Way of Life’, both of which were among the six texts favoured by the Kadampa masters. He also remarked that it was due to the efforts of the Abbot – Shantarakshita, the Adept – Padmasambhava and the King – Trisong Detsen that Tibetans today are proud to be custodians of the Nalanda Tradition. His Holiness recalled that under their auspices Samye Monastery was established with sections concerned with translation, discipline, meditation and so forth. Some Chinese teachers in the meditation section contended that meditation pre-empted study. Shantarakshita’s principal disciple Kamalashila was invited from India to challenge them in debate. He won the contest and composed the three volume ‘Stages of Meditation’ as a result. His Holiness continued to read the verses applauding the masters of the vast lineage—Asanga, Vasubandhu, Dignaga, Dharmakirti, Vimuktisena, Haribhadra, Gunaprabha, Shakyaprabha and Atisha. He again extolled the kindness of Atisha, Yeshe Ö and Jangchub Ö for their exertions to restore Buddhism in Tibet in the eleventh century. As he completed his reading of the ‘Praise to the 17 Masters of Nalanda’ he observed that there used to be those who dismissed Tibetan Buddhism as Lamaism. 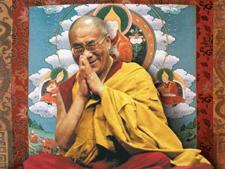 Now he has no hesitation in asserting that Tibetans are followers of the pure Nalanda Tradition. He lamented that Nalanda itself lies in ruins and acknowledged in passing the British role in identifying and unearthing most of the Buddhist sacred sites in India. Taking up Nagarjuna’s text, His Holiness read every verse of the ‘Commentary on the Awakening Mind’. He read briskly with occasional pause to comment and explain. When he was done he read another concise text with a similar title that was a commentary to the introductory verse from Guhyasamaja. His Holiness announced that tomorrow he will give the lay-person’s vows, lead a ceremony for generating the awakening mind and perform the preparatory ritual for an Avalokiteshvara empowerment that he will bestow the following day. He also undertook to read ‘Thirty-seven Practices of Bodhisattvas’. He returned to Ganden Phelgyeling in warm sunshine.